Some lives can be summed up in a sentence or two. Other lives are epics. 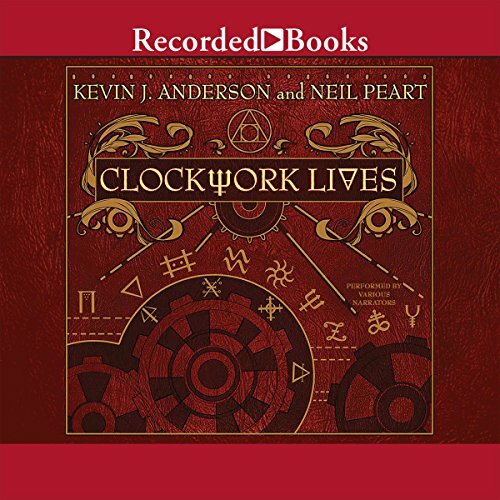 In Clockwork Angels, number-one best-selling author Kevin J. Anderson and legendary Rush drummer and lyricist Neil Peart created a fabulous, adventurous steampunk world in a novel to accompany the smash Rush concept album of the same name. Marinda Peake is a woman with a quiet, perfect life in a small village; she long ago gave up on her dreams and ambitions to take care of her ailing father, an alchemist and an inventor. When he dies, he gives Marinda a mysterious inheritance: a blank book that she must fill with other people's stories - and ultimately her own. Clockwork Lives is a steampunk Canterbury Tales and much more, as Marinda strives to change her life from a mere "sentence or two" to a true epic. I really liked the first one and loved this one. So creative and characters are brought in front (with a drop of blood). Hard to describe without spoiling. For Rush fans, there is an additional dimension\context to the album. Order versus Chaos versus Freedom? Definitely a great collection of stories. As with the first book, the authors leave you with the impression that an ordered existence can't be happy and free though. I suspect they were shooting to suggest balance but either way it doesn’t marr the story lines. I definitely enjoyed reading another edition of adventure in this fanciful steam technology world. Even better than the first novel and expanding on the first. If you enjoyed the first one you will enjoy this one too. Bravo! I enjoyed the first book, but this one is actually better. They also decided for Mr. Peart to not read it, which is a good thing. (Mr. Peart, if for some strange reason you're reading this, please don't be offended. You've got a laid back voice which isn't conducive to an exciting story) The story kind of reminded me of the Canterbury Tales, where different characters tell their own stories. There are several 'cameos' from the first book as well, but you don't NEED to read the first book to enjoy this one. Good tale and told well! While technically a sequel, I'd guess you say this was more of a companion piece to Clockwork Angels. In some ways it surpasses the original. Either way enjoyable. Kudos to the production team on the variety and quality of voice talent that brings the sub-stories to life. A well used credit!